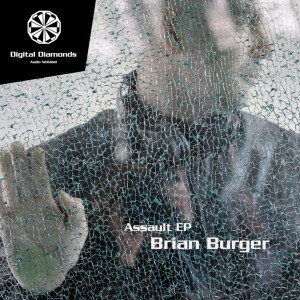 After his successful debut 12″ release on Nachtstrom Schallplatten, Brian Burger follows up with Assault, another deep and uncompromising techno and electro EP on Digital Diamonds. These tracks get straight to the point with dark, minimalistic, and intelligent techno beats, expressing Brian’s permanent concern for quality and commitment to research into higher level explorations of new technologies. MP3 Download | FLAC Download | WAV Download · Download count: 13,584. Released under a Creative Commons licence for noncommercial usage. Visit the Digital Diamonds discography for more free techno! Digital Diamonds also invites you to leave your feedback on this release. Keep up Great Job dude. Hello, very good sound man !!! I like . un burger, oui!!.. mais des fritttteeess!!!!!!!!!! fait peter le chedar et envois la sauce !!!!! Listened to this EP a second time in late 2012, still very good and deep. Clever work.